This event is brought to you by: Mom to Bed by 8 & Hosted by: Coupon Queen of Texas, Mommy May We?, MomStart, Mice In The Kitchen, Stay a Stay at Home Mom and Tech and Gadget News. 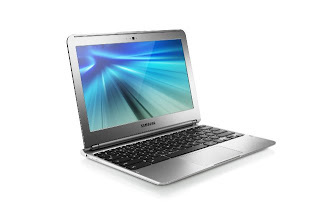 "The Samsung Chromebook 3G is a computer that helps you get everyday things done faster and easier. It starts in seconds, has virus protection built-in, and runs your favorite Google apps plus thousands more. The Chromebook comes with leading Google products, like Search, Gmail, YouTube and Hangouts, so you can work, play, and do whatever you want, right out of the box. You can easily share it with multiple people; switching accounts takes seconds, and everyone gets their own files, apps and settings. And it's simple to use. There's no setup, and your files are automatically backed up in the cloud. At just 2.4 pounds, 0.7 inches thin, and with over 6.5 hours of battery life, the Samsung Chromebook can go anywhere you go. It's built to stay cool, so it doesn't need a fan and runs silently. It also includes 100GB of free Google Drive storage (for 2 years), a built-in webcam, and dual band Wi-Fi to make it easy to connect to wireless networks. No more waiting for an affordable laptop. Go Chrome Today!" One very lucky reader will receive a Samsung Chromebook 3G! I would definitely give it to my husband as his is going kaput! GF - I'd do some major blogging with that nifty techno gadget! would give it to my hubby since he bought me 1 this year. I would celebrate as my old one is nearly dead! I want to do some writing, organize photos, and keep up with my family via email, etc. so this would be great!